UBS is an East Sussex based construction company offering our customers the very best wood framed building and carpentry advice in the South East. Our aim is to ensure our customers get the end results that suit their needs and expectations. We don’t believe in cutting corners and all our work is carried out to the very highest of standards. At Uckfield Building Services a happy client means a happy builder. James and the Uckfield Building Services team are passionate about building. They get a real buzz from building or restoring properties to the very highest standards. But the best things are the smiles of appreciation from customers who’s expectations have been comfortably exceeded. UBS boss James Brown has been working in construction for over 20 years. He started his career as an apprentice carpenter working on all aspects of carpentry and joinery. In that time James worked for a high end main contractor based in central London before progressing into senior site management. James has worked on some of the most prestigious private properties in Kensington and Chelsea. Having worked for some of the most demanding high end clients in central London James has become rooted in the idea that only the best will do. You can be assured that he will lavish the same care and attention to YOUR PROJECT regardless of the size or budget. Builders often get a bad rap for being slapdash and unreliable. But one of James Brown’s ideas in setting set up Uckfield Building Services was to challenge that stereotype. He wanted to show his clients that builders could be as prompt courteous and reliable as any professional person in the land. Let James show you how it can be done. I have had the great pleasure of working with James over the last two years. He has been working on my very complicated house build. Through these two years he has got to know me more than I realised and knew instinctively what I would and wouldn’t like in the build and was always one step ahead of me. I have thoroughly enjoyed working with James and his team and found his attention to detail fantastic and would highly recommend him to everyone. You have now found the builder you are looking for. A fare quotation and quality building at a good price with James Brown managing every part of the project. 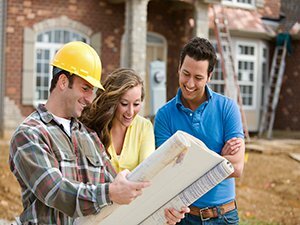 All the experienced tradesmen were friendly and stuck to their tasks until completion. James will keep you abreast of progress at every stage of the build until District Planning Sign-off. This was a first floor extension, creating a bedroom; en-suite & dressing area with wardrobes. Highly recommended.